> SCROLL DOWN to read about the symbolism of this one-of-a-kind hair barette. This silver-and-stone storyteller hair slide depicts Mikinaak (the Great Snapping Turtle), or Mishikenh (the Mud Turtle), a beloved aadizookaan (patron) who has a special place in the traditional worldview and storytelling of many Native Peoples of Turtle Island (North America). 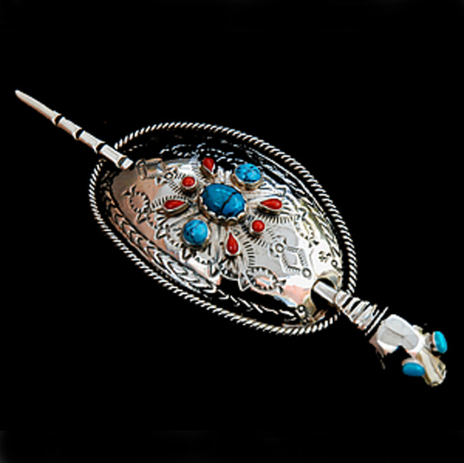 The hairpin is adorned with five turquoise, and six red coral cabochons. The turquoises, three mounted on the silver turtleback and two on the head representing the turtle’s eyes, are emblematic of the five archaic animal totem groups of the Anishinaabe Peoples: Ajiijaak (Crane), Nooke (bear), Moozwaanowe (Little moose tail), Giigoonh (Fish), and Mikinaak (Snapping Turtle). These principal totems denote the five needs of the People and the five elementary functions of society. MEDICINE, represented by turtle and symbolized by the oval turquoise stone in the center, is flanked by LEARNING (bullhead; top) and SUSTENANCE (little moose tail; bottom); the turquoise eyes signify LEADERSHIP (crane) and DEFENSE (bear). The red coral cabochons symbolize the six animals that make up the MEDICINE DOODEM: Mikinaak (or Mishikenh, the turtle) Nigig (otter), Omakakii (frog), Midewewe (rattle snake), Omisandamoo (water snake), and Niibiinaaabe(kwe) (mermain or mermaid). Finally, the stamped designs on the domed turtle’s back symbolize the re-creation by Sky Woman - of respectively flora and fauna, fishes included. The rim of braided silver wire that the jeweler soldered around the oval turtle shield represents the strong clanship ties (odoodeman) and the unity and survival strength of the Anishinaabeg as a people. For further reading about the Anishinaabe odoodeman, go to our art blog.